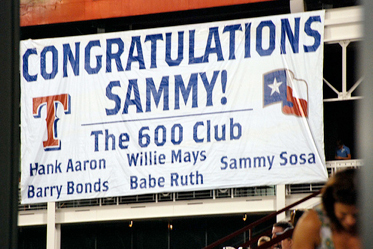 There may be quite a few players who have scored 500 home runs in their baseball careers, but only five men have managed to beat that record, and stay in the 600 Home Run Club. Mentioned below are some of these elite sluggers who have been adored across the country. Willie Mays has been a member of the sport’s Hall of Fame since 1979. Having spent most of his career in MBL with the San Francisco and New York Giants, he ended his glorious 22 years on the ballpark playing for the New York Mets. He notched up two MVP awards during his career, and currently shares the record held by Stan Musial for the highest number of All-Star Game appearances. When retiring, Mays was the third-highest all-time scorer with a staggering 660 home runs. He also holds the record for the most Gold Gloves won by a center fielder (Twelve Gold Gloves). A-Rod as he is popularly known, Alexander Emmanuel Rodriguez, who featured for the Texas Rangers and Seattle Mariners before moving to the New York Yankees, is regarded among the best ballplayers to have ever graced the game. He holds the record for being the youngest slugger to reach the 500 home runs mark, and is also the youngest to reach 600. His achievements have bettered long-time legends such as Jimmie Foxx and Babe Ruth. Not only did he receive due credit for his inspiring accomplishments, but he also holds the richest contract in the history of baseball – a ten-year deal worth $275 million, penned in the December of 2007. Nicknamed “The Kid” and “Junior”, George Kenneth Griffey, Jr. spent 22 years in MLB featuring for the Seattle Mariners, the Cincinnati Reds, and the Chicago White Sox. Having appeared thirteen times in the All-Star Game, Griffey is remembered for his prolific home runs. At 630, he is the sixth-highest scorer in the history of Major League Baseball. His skills extended to beyond slugging, as he claimed ten Gold Gloves from center field. He holds the joint-record of scoring home runs in eight consecutive games. James Howard Thome has featured for the Baltimore Orioles, Minnesota Twins, LA Dodgers, Chicago White Sox, Philadelphia Phillies, and Cleveland Indians in an illustrious career spanning 21 years. He is the eighth player in MLB history to reach 600 home runs, and his career total of 612 runs, is the seventh-highest ever. Power hitting was perhaps Thome’s best skill. He holds the record for scoring over 40 home runs in 6 different seasons. Samuel Peralta Sosa featured for Texas Rangers, Chicago White Sox, Chicago Cubs, and Baltimore Orioles in a career spanning from 1989 to 2007. On his return to the Rangers in 2007, Sosa breached the 600 home run barrier to become only the fifth player to do so in the league’s history. He remains the highest scoring foreign-born player in MLB. He also holds the record for being the only slugger to score 60-plus home runs in three different seasons.